Want a powerful BB handgun for your airsoft skirmish games? The WWII German MK1 Gas Pistol is an excellent choice then. 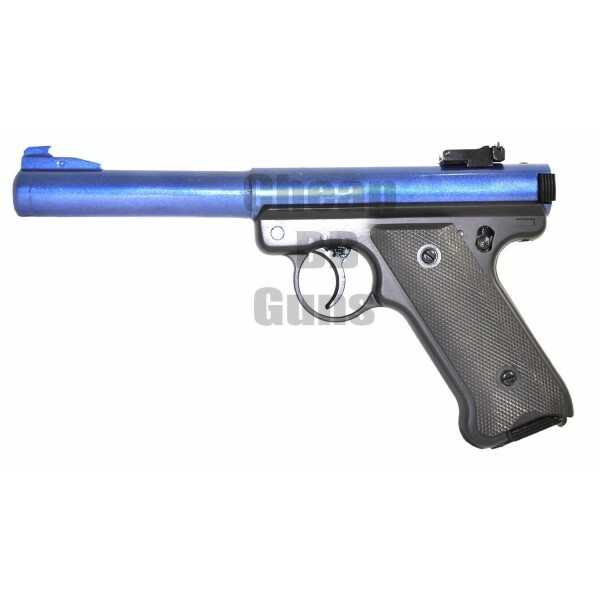 Made of ABS plastic and metal, this blue and black coloured airsoft pistol is easy to hold and use too. The non-blowback single shot pistol may not make a great primary weapon but it sure is an excellent backup in your airsoft skirmish games. The classic-styled airsoft pistol is an exact replica of the WWII German pistol is also an excellent collector's item. The design of the MK1 gas airsoft pistol is traditional. It is a single shot non-blowback BB gun that weighs approximately 600 grams. The barrel of this pistol is made of metal and is blue in colour, while the grip and the magazine are made of sturdy ABS plastic. The BB gun is small and can even fit into your pocket. But don’t let its size fool you. The BB pistol has an FPS of 390 and a 55 meter range. The FPS of this airsoft pistol is pretty high for its size and makes it a highly accurate tool to use in the airsoft skirmish battlefield. The pistol also comes with a working safety switch to prevent accidental shooting. It is highly recommended that you use the WWII German MK1 Gas Pistol with safety gear and measures in place. Use of safety goggles, vest and mask is a must to prevent injuries when you use this BB gun.